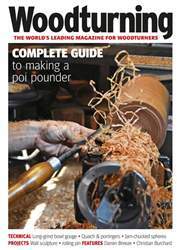 Issue 315 of Woodturning is filled with interesting projects and need-to-know techniques. Project this month include Pat Carroll’s multi-part wall sculpture, Rick Rich’s kitchen-towel stand, Emiliano Achaval’s Hawaiian-inspired pestle and mortar and a rolling pin by Chris West. 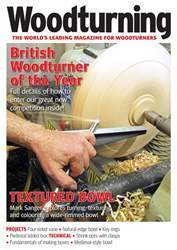 Techniques covered this issue: Mark Sanger explores using a long-grind bowl gouge. 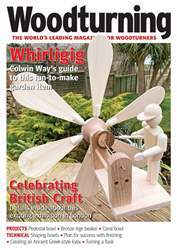 Richard Findley makes replacement finials for a piano, Ernie Conover shows a jam-chucking method for turning spheres, Kurt Hertzog explores displaying work for maximum effect and Mark Baker explains the fundamentals of chatterwork. 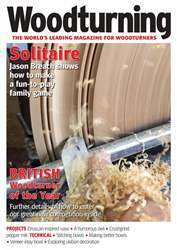 Turn to our ‘Features’ pages for John Plater’s discussion on pitching a sale, The AAW talks to Christian Burchard, Geoffrey Laycock looks are fire safety in the workshop and The editor talks to Darren Breeze about his work and how he got into turning. All this and more in issue 315 of Woodturning!